Lodgepole Chipmunk. Photo by Dr. Lloyd Glenn Ingles © 1999 California Academy of Sciences. 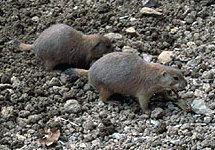 at left), yet another South American species, is the largest living rodent. About the size of a pig, and reaching a maximum weight of 50 kg (110 pounds), the capybara is truly a rodent of unusual size. 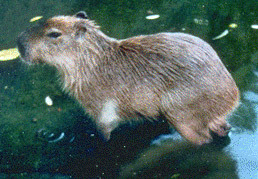 Capybaras live along rivers in the llanos (plains) of South America, and are often hunted or even ranched for their meat. gliding "flying" squirrels, from aquatic capybaras and muskrats to desert specialists such as kangaroo rats and jerboas, and from solitary organisms such as porcupines to highly social organisms living in extensive colonies, such as prairie dogs (left) and naked mole rats. Rodents cost billions of dollars in lost crops each year, and some are carriers of human diseases such as bubonic plague, typhus, and Hanta fever. However, various rodent species are economically important as sources of food or fur in many parts of the world, and others are used extensively in biomedical research. Many early mammal taxa were superficially rodent-like, such as the extinct multituberculates. However, true rodents first appear in the fossil record towards the end of the Paleocene epoch. Their ancestry is probably to be found among a group of small fossil mammals known as anagalids, which may also have given rise to the Lagomorpha. The living rodent with the most archaic characters, most like the common ancestor of the Rodentia, is the sewellel or mountain beaver (which is not a true beaver at all) of the northwestern United States. During the Oligocene, the South American rodents began their great evolutionary radiation. By the Miocene, very modern-looking squirrels had evolved, as had the murids. Murids began their spectacular radiation in the Pliocene. Noteworthy Pleistocene rodents include the extinct giant beaver, Castoroides, which was about the size of a bear. More prosaic rodent fossils from this time period, notably the teeth of voles and mice, have become important in reconstructing global climate patterns as well as in fine-scale studies of evolution.